Kevin Brownlee is the Curator of Archaeology at Canada’s renowned Manitoba Museum. 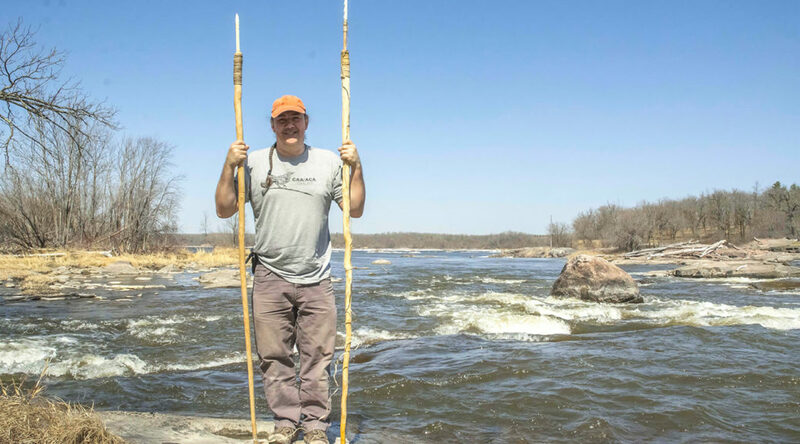 Through experimental archaeology and the emerging field of indigenous archaeology, Kevin has been able to shed new light on artefacts found in Manitoba. In particular, he focuses on the archaeology of Manitoba’s boreal forest and sub-arctic. Kevin is of Cree heritage and is a member of Kinosao Sipi Cree Nation also known as the Norway House Cree Nation. He obtained his Master’s Degree in Anthropology from the University of Manitoba. He has been Curator of Archaeology at the Manitoba Museum since 2003. Kevin has spent his career working with Indigenous communities raising awareness of ancient heritage and archaeology. Prior to working at the museum, he served as an Aboriginal Liaison Officer for the government of Manitoba. 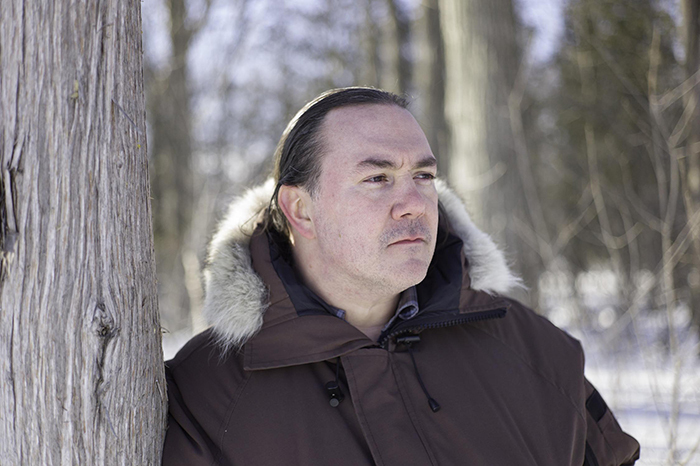 Kevin Brownlee, Curator of Archaeology at the Manitoba Museum, has spent his career working with indigenous communities and raising awareness of ancient heritage and archaeology of the boreal forest and sub-arctic. Photo courtesy of Kevin Brownlee. The Manitoba Museum, which was originally called the Manitoba Museum of Man and Nature, is the largest heritage centre in Manitoba and one of the largest in the World. From the perspective of my love of bushcraft skills, I’ve always been drawn to the museum since I first knew of its existence, enticed by what I could learn from its exposition of the natural habitats of Manitoba, in particular the boreal forest, including how humans have existed and lived there for thousands of years. The museum focuses on combined human and natural heritage subject matter in a very integrated way. I have visited the Manitoba Museum a number of times on previous stays in Winnipeg. Indeed I made a short video blog of one of my visits in 2015. Through my visits and viewing online materials related to the museum, I had been aware of Kevin Brownlee’s work for a number of years. So, it made sense to me to reach out to Kevin to have a conversation about his work and the insights this provides. 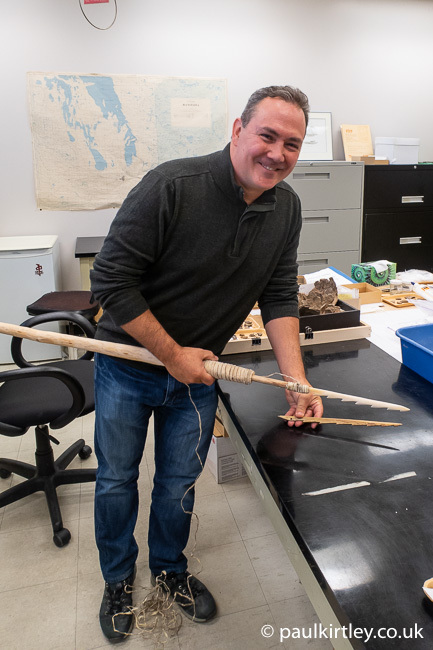 Kevin Brownlee in the Manitoba Museum archaeology lab with the harpoon recreation based on a harpoon point, made of the leg bone of a moose, in the museum’s collection. Photo: Paul Kirtley. Finally don’t forget to leave an honest review & rating on iTunes or on Stitcher or your favourite podcast app. So, with no ‘legal’ incentives, like rock quarrying, or power lines / dams, or roads through the system, there are undiscovered artifacts out there left uncovered due to lack of social/economical/political interests, but, it may well be worth doing an archaeological three month expedition in a spiral fashion to locate possible goodies. One traditional river route (Bloodvein) is a starter, but were there alternate routes (river-ways) used by the “Dreamers” who recorded some concept of their vision on another rock location? Are there secret places frequented by the ‘Dreamers’ which are undiscovered yet? I very much suspect the answer to this question is yes…. Part 2 of my comment. (sorry for being long-winded, but this one really got my brain clicking.) It fortifies my belief that the old ones were not so primitive after all, because as the knowledge of weather lore, which the professional trapper has, or the use of clay pots with rounded bottoms was a better solution for open fire coal cooking, these show there was a total awareness to the immediate environment. It is when people were forced to become nomadic that the portable generic trade-offs happened, metal pots, portable shelters, etc. The advantages of communities, with experienced elders that recorded the local elements, the patterns of animal movements, the number of moons in a season compared to the same previous season, etc. show the complex minds of these so-called uncivilized nations. There is so much we need to learn from nature, from tried and true indigenous methods, and these are just now resurfacing to public knowledge through bushcraft practice. Now this is why I love bushcraft. The Europeans who migrated here, such as Samuel Hearn, who learned to use these experiences by re-learning and re-shaping their thought processes, those we call pioneers, are those who were simply evolving from a stagnant mindset. Great podcast! Very much enjoyed it. I’m only 5 or 6 hours from the Manitoba Museum so a field trip is in order. Thanks very much. It’s good to hear from you. Thanks for your comment – glad you enjoyed the podcast. Yes, you should definitely take a visit to the museum. I think it is set to become even more valuable as they renovate and refresh some of their displays too. A truly fascinating discussion. I am a firm believer in experimental archaeology and the use of traditional knowledge to help explain the archaeological record. It was really interesting to hear about the bias that often creeps into scientific interpretation, whether based on the ‘academic/scientific method’ or on the (clearly false) assumption that western/white/modern mans technology/interpretation is automatically the best. All tools/art have a cultural basis and need to be looked at in the light of similar cultures. Thanks again and more of the same please! It’s good to hear from you and thanks for your comments. I’m glad you appreciated this episode and I’ll do my best to bring more like this. I was listening to this podcast whilst sieving sediments from augerings I did recently as a professional archaeologist. We use augerings as a way to detect stone age sites, by mapping flint artefacts that come up in these augerings and thus gathering information on the density of the find site and the spatial distribution of it to determine where the concentrations are that deserve future excavation. At Uni I learned that analogies can be drawn between North American/ Canadian indigenous ethnography and the palaeolithic and mesolithic periods in Europe. The idea being that the same climatic zone with more or less the same vegetation and wildlife would spawn similar survival strategies and thus cultures in hunter-gatherer societies. And yes it is very frustrating that all we have as a source of information is only some flint, maybe a few tool fragments in organic material (bone/antler) and charred food remains, which is just a mere fraction of the material culture that was available back in the day. And yet we construct entire ethnic cultures around them. But what these people’s beliefs were or how they percieved the world and what cosmogenic stories they told we can only guess. It is just plain wrong to describe the people in prehistory as “primitive”, since their knowledge of the natural world around them must’ve been a thousand times more elaborate and intense than we can ever imagine. If only we could go back to a pristine world where nature reigns sumpreme I sometimes dream, but it’s just not possible turning the clock backwards 10.000 years or so. And even if it were possible, I woudn’t know how to survive in it (but maybe you do), but that’s another story. Thanks Paul, I thoroughly enjoyed this podcast. A lot of what was said made sense and it put my job back into a healthy perspective. Keep up the good work!